Tobias Huber is the laureate of the Anton Paar Award for Physics 2017. 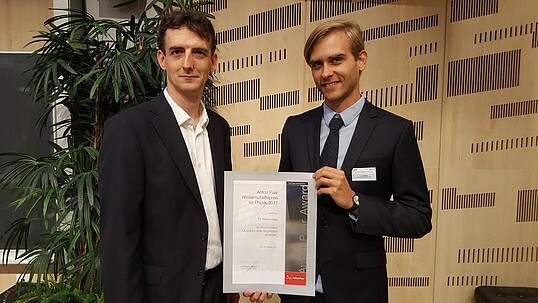 He was awarded for his doctoral thesis at the University of Innsbruck on the topic of „Quantum dots as photon sources“. Thomas Pühringer, Managing Director Anton Paar TriTec and Anton Paar Switzerland, presented the certificate to him. The awards ceremony took place at the European Organization for Nuclear Research (CERN) in Geneve. Tobias Huber was born in the Austrian region of Tyrol in 1986 and after his formal education he started his bachelor and master program in physics at the University of Innsbruck (Austria) where he also completed his PhD program in that field. Since 2016 he works as a Post-Doctoral Fellow at the Joint Quantum Institute of the University of Maryland & National Institute for Standards and Technology (NIST) in Gaithersburg (US). On the picture: Thomas Pühringer (left) and Tobias Huber.